The European Union issued a statement on the latest developments in and around Gaza, wishing a speedy recovery to those injured. "Rocket attacks from Gaza and any other violent actions or provocations by Palestinian militants in Gaza must stop immediately," the statement from Brussels declared. "The European Union reiterates its fundamental commitment to the security of Israel. "In the wake of the Israeli reaction, the first priority for all must now be for de-escalation and maximum restraint, in order to re-establish calm and to protect the lives of Israeli and Palestinian civilians. 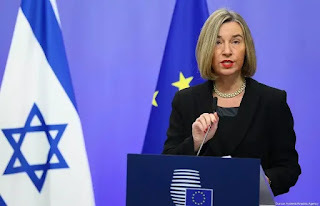 The EU reiterates its full support to the efforts of Egypt and the UN to reduce tensions and to alleviate the situation for the people in Gaza," concluded the European Union communique. Israeli planes attacked the offices of Hamas chairman Ismail Haniyeh in the Rimal neighborhood of the northern Gaza Strip.